Oscar Grant. Michael Brown. Eric Garner. Freddie Gray. Anthony Hill. Philando Castile. Alton Sterling. These are just a few names from a much longer list of black men who have died at the hands of law enforcement in less than a decade. So when the new Fox show Shots Fired ran early trailers zoning in on a black cop, played by Tristan “Mack” Wilds, who kills a white kid, it’s understandable if the show didn’t quite add up. Everything isn’t always as it appears, especially when it comes from husband-and-wife creative duo Gina Prince-Bythewood and Reggie Rock Bythewood. Separately, Gina has given us Love and Basketball and, most recently, Beyond the Lights, while Reggie wrote Get on the Bus and was a writer-producer on New York Undercover. They themselves met in the writers’ room of A Different World. So they have both been intimately involved in bringing dynamic and versatile representations of who we are to life. And because of that, Shots Fired is much more than what it seems. First of all, the 10-hour limited TV series tackles the murders of two people: Jesse Carr, who is white and in college, and Joey Campbell, a black teenager. Stephan James, who most recently played Jesse Owens in Race and John Lewis in Selma, is Preston Terry, lead prosecutor from the U.S. Department of Justice dispatched to a small North Carolina town for the case in which Jesse Carr was killed by Wilds’ character, Police Officer Joshua Beck. 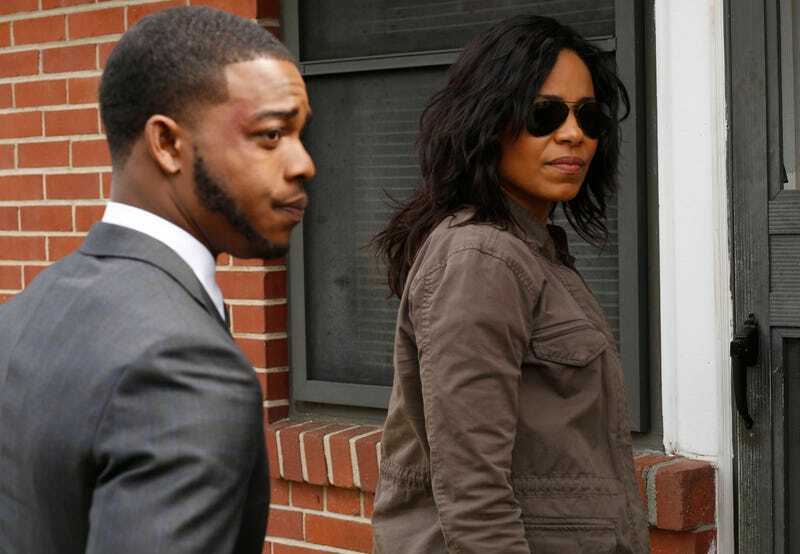 Sanaa Lathan, reuniting with Gina for the first time since Love & Basketball, plays Ashe Akino, Terry’s assigned DOJ investigator a few years his senior. The seeds for Shots Fired were sown long before Gina got a call from Imagine and Fox about creating a project inspired by the shooting death of Michael Brown in Ferguson, Mo. George Zimmerman’s acquittal in the killing of Trayvon Martin in Sanford, Fla., in 2012 actually set it all in motion. Reggie and their oldest son, Cassius, who was 12 at the time, watched the verdict come in, and Cassius was “pretty emotional and teared up,” recalls Reggie. “Being the dad that I am, it didn’t feel right to hug him and tell him it was going to be OK,” Reggie says. Instead, he showed him a documentary on Emmett Till and broke down the cold, hard history of what young black boys have experienced in this country. To flesh out Shots Fired, the Bythewoods looked to present-day incidents and history. “Research is such a huge part of our writing process,” shares Gina. And some of that research included conversations with former U.S. Attorney General Eric Holder; Oscar Grant’s mother, Wanda Johnson; and others. Both Holder and Johnson were big inspirations behind Stephan James’ Preston Terry and relative newcomer DeWanda Wise’s Shameeka Campbell, mother of Joey Campbell. “Eric Holder is such a great template for our character Preston and absolutely someone that our character would want to emulate,” Gina says. James concurs. At a promotional screening for Shots Fired in Atlanta, Wise—whom Reggie felt could “bring a level of dignity to a person below the poverty line like Shameeka”—spoke of how impactful it was to attend the annual birthday celebration Oscar Grant’s mother hosts for the community. “Before they had the actual dinner at night, all of them spoke at church, and I am literally watching mother after mother get up and speak about the death and murders of their sons and none of them cry. And that, for me, was the very foundation for constructing Shameeka,” she explains. Aisha Hinds’ Pastor Janae James brings the two mothers together and, really, the entire series. A combination of Black Lives Matters and old-school, church-led civil rights activism in the vein of Martin Luther King Jr. serves as the prototype for Pastor Janae, as Hinds’ character is known. A powerful presence in the community where Shameeka still lives with her youngest son, Shawn, Pastor Janae even commands an audience with the governor, played by Helen Hunt. In many ways, she is the catalyst for the protests that erupt around the DOJ’s investigation and drives much of the later drama in the series. Lathan’s Ashe Akino is another refreshing departure from the norm in that she is not only a DOJ investigator but also a former police officer and a onetime undercover agent who infiltrated drug cartels. On top of that, she is a mother in a contentious custody battle. Unlike Hinds for Pastor Janae, though, Lathan says that she drew from two remarkable women. One, a Latina, she explains, “had the exact job as Ashe Akino. She spent 20 years in law enforcement and went undercover in the drug cartels in Mexico and Colombia. And I talked to another woman, a black woman, who was a patrol cop for many, many years. Shots Fired, to be clear, is good and compelling television that stands on its own, even without its steep investment in issues of social justice. “We were definitely careful to not make this a public service announcement,” Reggie says. “This is really entertaining,” Lathan insists. “A lot of times, when we’re doing our interviews, the subject matter is so heavy. I really want people to know it’s actually still a mystery thriller. You’re still going to be entertained. For both Gina Prince-Bythewood and Reggie Rock Bythewood, Shots Fired is the best of all worlds. “The fact that we could create any show we wanted and tell this story any way we wanted, we felt like it was an opportunity that we couldn’t pass up,” says Gina.